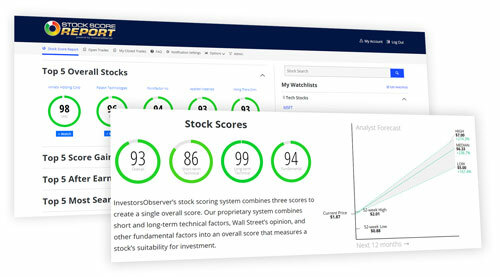 InvestorsObserver has a new screening tool, the Stock Score Report, which we have been monitoring the last several months. We have managed to consistently find attractive buying opportunities, and this week is no exception. The new screener uses both fundamental and technical data when computing an overall ranking of the stock universe and using both approaches has produced a lot of strong names. Strong technical scores illustrate the market’s bullish view on the stock, and when combined with solid underlying fundamentals the stocks near the top of the ranking possess what it takes to continue to build on their recent gains. It is always important to remember that past performance is no guarantee of future performance, so we cannot blindly jump into any stock just because of their recent trend, but with such strong underlying fundamentals, each of the following stocks look attractive and should be considered when looking for new buying opportunities. This week’s group of stocks contain some familiar names which have dominated the rankings for months now. Each of the stocks has been a top performer, and the group is diversified enough to allow investors the opportunity to set up new positions in each of the securities. As always, do your own homework, but these stocks are a great starting point when considering new positions for your portfolio. Social media leader Facebook (FB) remains near the top of the rankings on InvestorsObserver with an overall ranking of 95 on the Stock Score Report. With the exception of a brief sell off in the wake of the company’s data scandal earlier this year, FB has been a top performer for the last several years, and shares are currently just shy of their all-time high. The company has impressed the market with its strong growth numbers, and despite the data scandal it has not experienced a drop in advertisers as some analysts expected. Analysts expect Facebook to grow earnings by 26.2% per annum over the next five years, which should be enough to keep the stock moving in the right direction. Analysts have a $217.74 price target on the stock. Home goods retailer At Home Group (HOME) has been a fixture at the top of the rankings for some time now, and the stock remains near the top with an overall ranking of 95 from InvestorsObserver’s Stock Score Report. The company gets very rare perfect scores for both its short and long-term technicals, and with a solid fundamental ranking, the stock looks very attractive. HOME trades near its all-time high at $39.45 and analysts have a $43.14 price target on the stock. With the company expected to grow earnings by 25.2% over the next five years, the stock should continue to build on recent gains as long as its future estimates are met. Boot Barn (BOOT) enjoyed strong growth in the final months of 2017, and built on those gains in the first part of 2018 before running out of steam in June. The stock hit a ceiling and has trended slightly lower over the last month despite a very strong quarterly report mid-May. The selling could just be investors locking in some gains after the stock’s strong run, and with a forward P/E of just 16.8, the stock does not appear to have hit overbought territory just yet. BOOT gets an overall ranking of 91 from InvestorsObserver’s Stock Score Report, and analysts have a $26.25 price target versus the current price of $22.10. Payment processor Visa (V) ranks near the top of the stock universe with an overall ranking of 89 from InvestorsObserver’s Stock Score Report. The company gets strong rankings in both the technical and fundamental screeners, and the stock is currently trading just shy of its all-time high. Strength in the overall economy and low unemployment has kept strength in the sector, and last year the average balance U.S. households had on their credit cards reached an all-time high. Analysts expect the company to grow earnings by 18% per annum over the next five years which will keep strength under the stock moving forward. V trades at $133.38 with an average price target of $145.67. 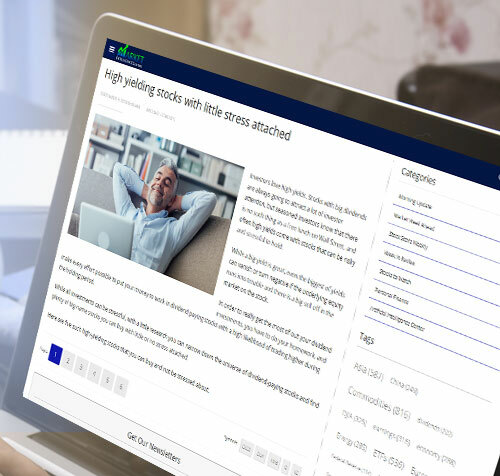 Online broker E*Trade (ETFC) has enjoyed a bullish run over the last year, as the market expects rising interest rates to drive earnings higher moving forward. The company makes more from interest income than it does from account fees and trading commissions, so higher interest rates should provide a major boost to the company’s bottom line. Analysts expect to see earnings grow 25.8% per annum over the next five years, and with a forward P/E of just 15.4, there appears to be a lot of value in the stock at this point. ETFC gets an overall ranking of 89 from InvestorsObserver’s Stock Score Report. The stock trades at $62.28 with an average price target of $69.27.